Pascal-powered notebook with G-Sync starting at $1400. 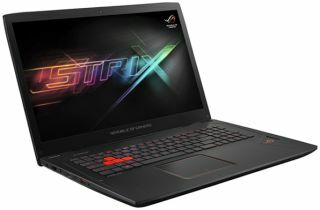 Asus and its retail partners have begun taking orders for its ROG Strix GL702VM, a 17.3-inch VR-ready gaming laptop powered by Intel's Skylake architecture and Nvidia's Pascal-based GeForce GTX 1060 GPU with 6GB of GDDR5 memory. It's also one of just a few models to sport both the ROG and Strix branding (in case that's important to you). This laptop makes more sense than the recently announced GL553VW, which Asus inexplicably saddled with last generation graphics (Maxwell), and a GTX 960M at that. The GPU felt out of place on what is otherwise a well-equipped machine. That isn't the case here. Starting at $1,399 (GL702VM-DB71), the GeForce GTX 1060 locks arms with an Intel Core i7-6700HQ processor and 16GB of DDR4-2133 RAM. It also has a 1TB hard drive (7,200 RPM), though for $200 more, the GL702VM-DB74 adds a 256GB SATA 6Gbps SSD to the mix. Other than the storage scheme, both SKUs sport the same amenities, including a Full HD 1080p (1920x1080) display resolution with G-Sync support, 802.11ac Wi-Fi and Bluetooth 4.1 wireless connectivity, dual speakers, a GbE LAN port, three USB 3.0 ports, a single USB 3.1 Thunderbolt Type-C port, mini DisplayPort 1.2 and HDMI output, a combo audio jack, and Windows 10 64-bit. Asus ROG also calls attention to the anti-ghosting tactile gaming keyboard. It doesn't appear to be a mechanical plank, though Asus says the keys offer 1.6mm of travel distance and up to 30-key rollover protection for accurate keystrokes. Neon orange colored keycaps highlight the WASD keys. The ROG Strix GL702VM measures 16.53 x 10.82 x 0.86-0.97 inches and weighs 2.7kg / 6.02 pounds. Those metrics aren't too shabby for a gaming laptop.